The Daisy Powerline 880 is a multi-pump bolt action pellet gun with a maximum pellet velocity of 670 fps with lead pellets and 800 fps with BBs. The Powerline 880 is composed of both plastic and metal components. 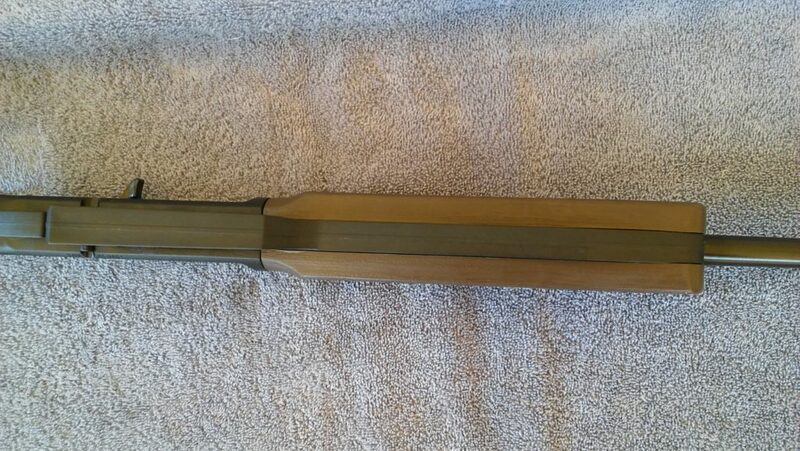 The barrel is steel with a resin shroud and is fully rifled. 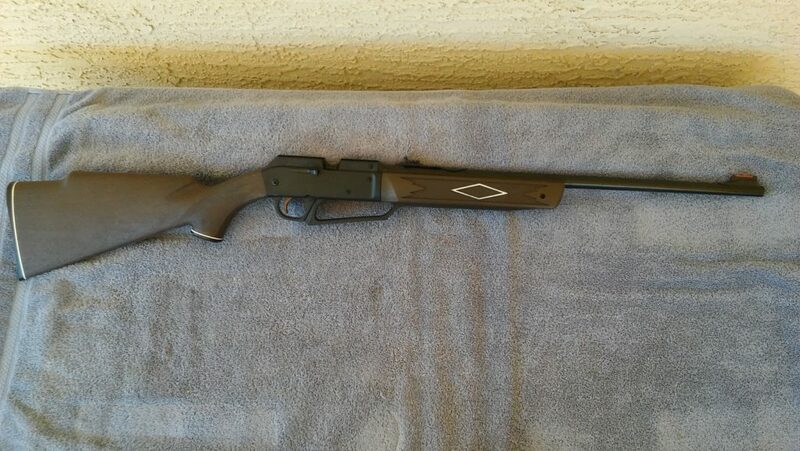 It is a very handy pellet gun (overall length is 37.5″) and is comfortable to shoot all day. It is also a lot of fun. I bought this Daisy Powerline 880 at Walmart about 6 years ago for $35. Ever since I was a kid, I wanted a Powerline 880. It’s a great pellet gun for people of all ages. It’s accurate, powerful and light weight. The Powerline 880 weighs a little over 3 lbs and is made mostly of plastic. It is very easy to pump since it has a long pump lever/arm. For target practice 3 – 5 pumps are great and for hunting 10 pumps produces the maximum velocity. So I used an app on my Android phone to measure the noise level at various power levels. I placed my smart phone about 18″ from the muzzle of the 880. Just remember that I am measuring the noise level very close to the gun. Your neighbors will be much farther away and noise levels will be a small fraction of this measurement. Here are some comparisons of common noises. The Daisy Powerline 880 pellet gun features a plastic receiver with metal internal parts and bolt. 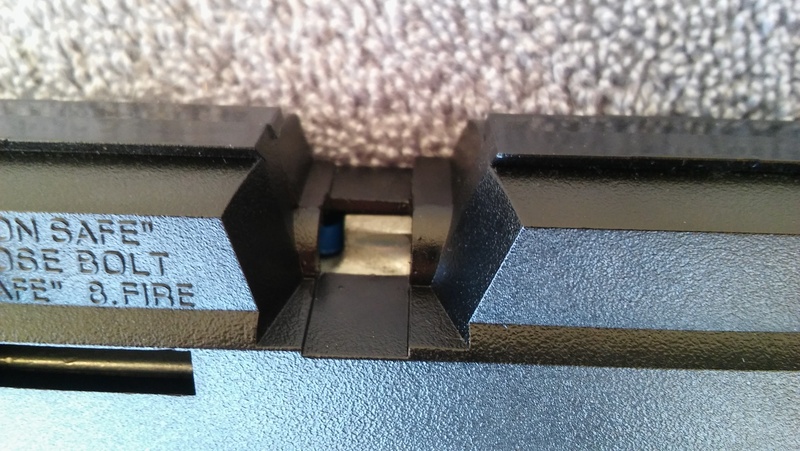 The plastic receiver is finished in a non-glare metal like bluing finish. It looks very much like metal. 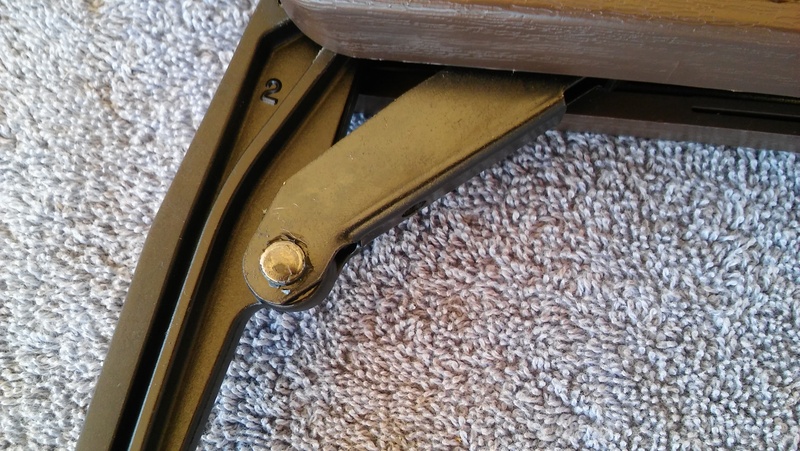 The bolt handle is plastic and pulls straight back to load BBs or pellets. 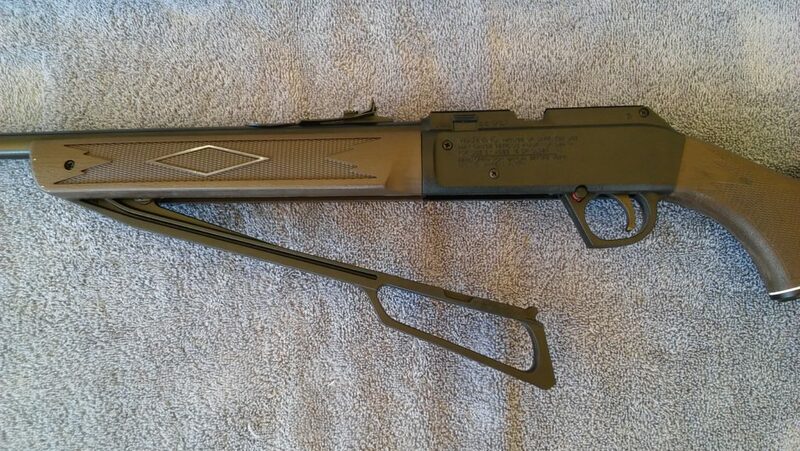 The trigger guard and pump handle are also plastic. 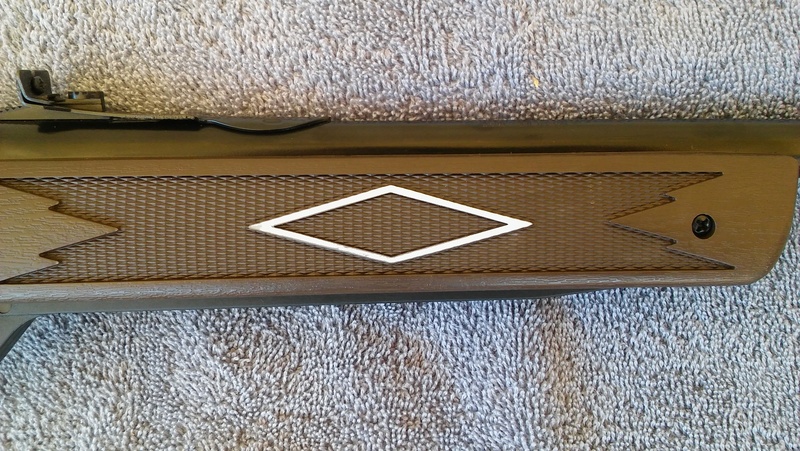 The Daisy Powerline 880 has a simulated wood Monte Carlo stock with white line spacers. It is very attractive and shoulders very nicely even though the LOP is much less than a real rifle. 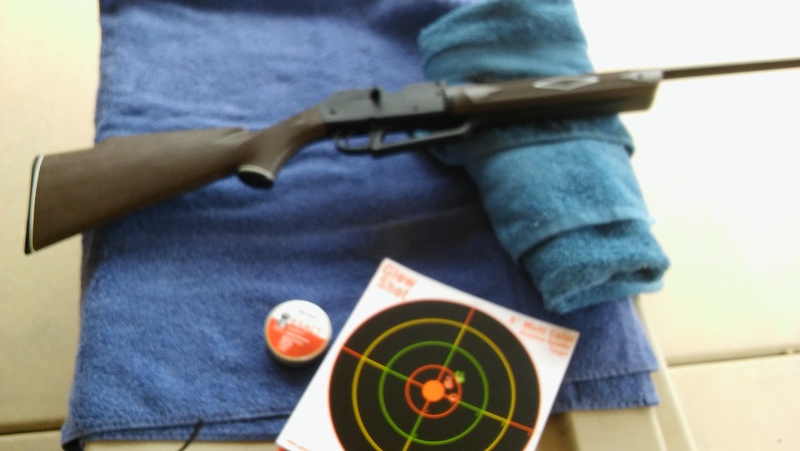 This Monte Carlo stock works well with open sights and a scope. I have used both with great success. 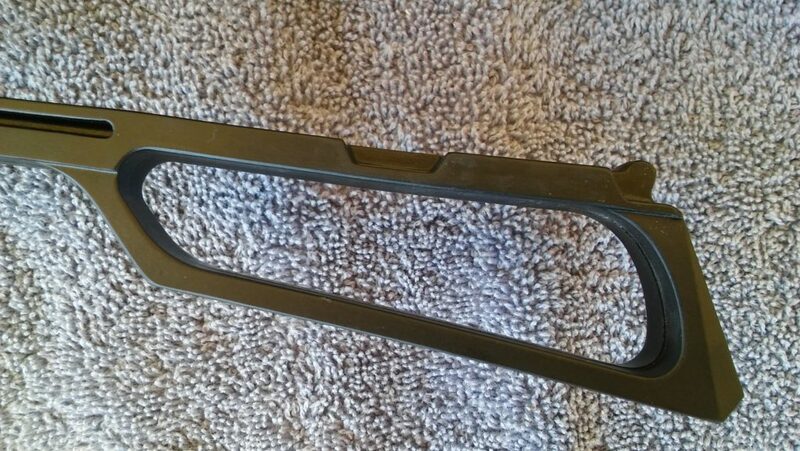 The plastic stock is very durable and water-proof. It will last a long time if you are careful with it. If you drop it off of a cliff, it will break. Just be smart. The finish on the 880 receiver is a flat black and is great when shooting outside in direct sunlight. 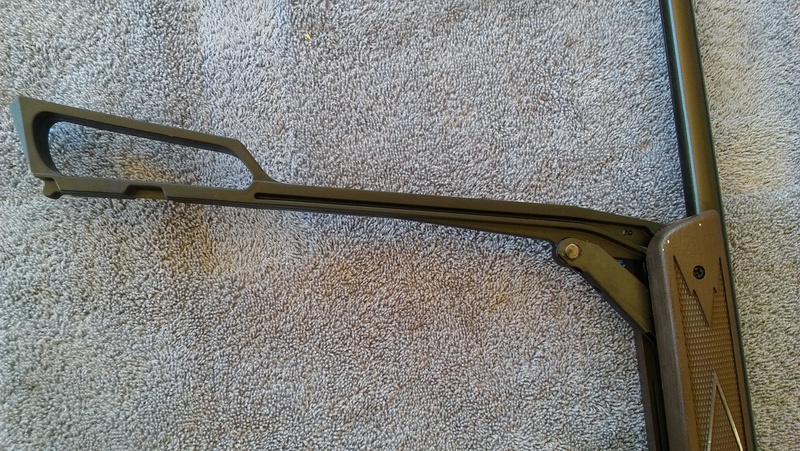 The bolt handle is very comfortable to pull back and then push forward. The trigger is metal and wide. It feels very good on your index finger. I really like how the pump handle blends in with the trigger guard. Very nice design. 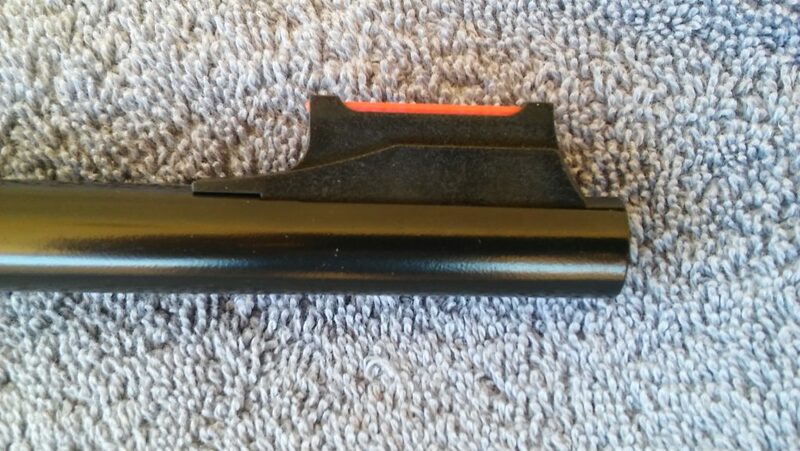 The forend is also plastic with a simulated wood grain. The white outlined diamond is a very nice touch. 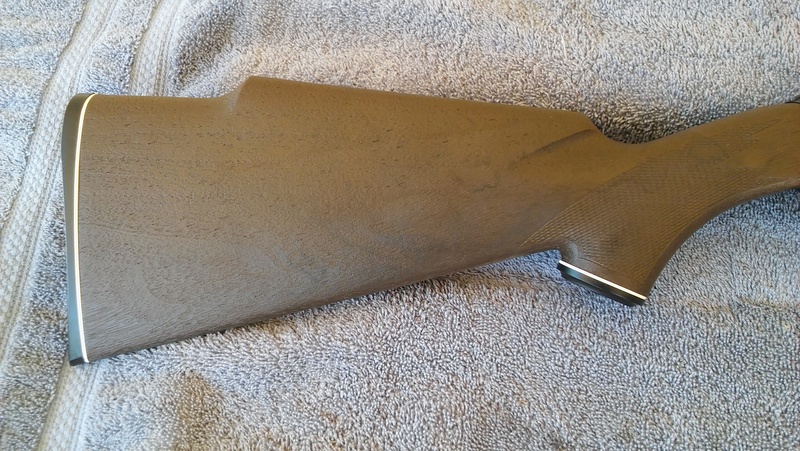 The forend is checkered and provides a very good non-slip grip even in the rain. 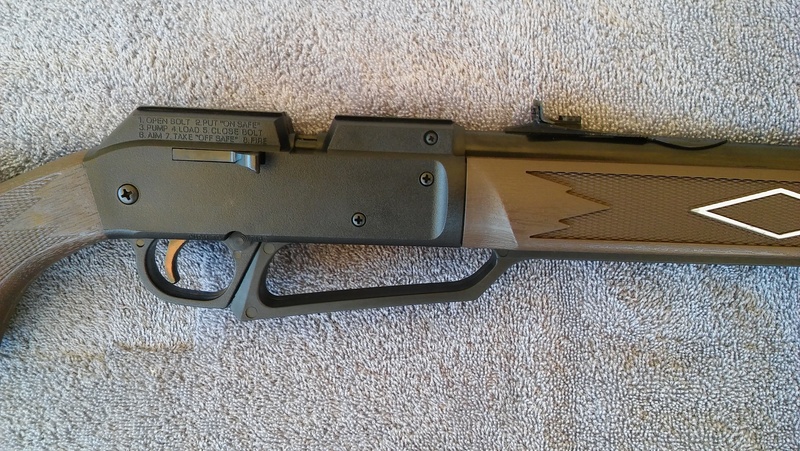 The 880 forend is nice and wide and gives your hands something to hold on to. The pump arm is located in the center of the forend. 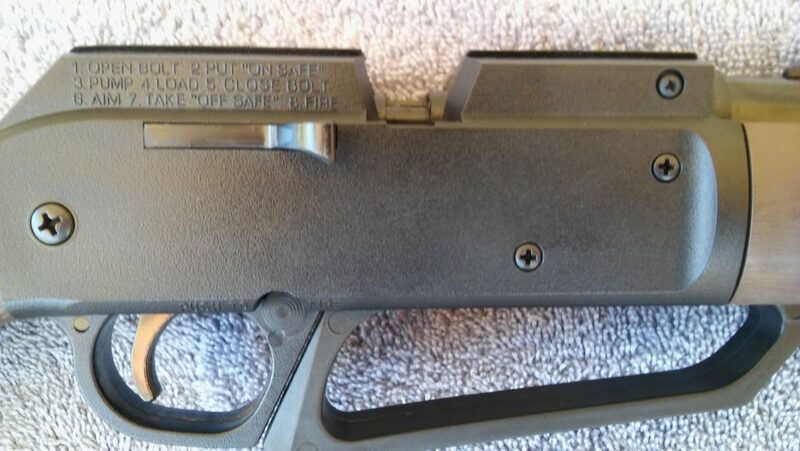 It’s also flat on the bottom which makes it ideal for bench rest shooting. It will sit flat and not rock. The Daisy Powerline 880 comes with open sights. 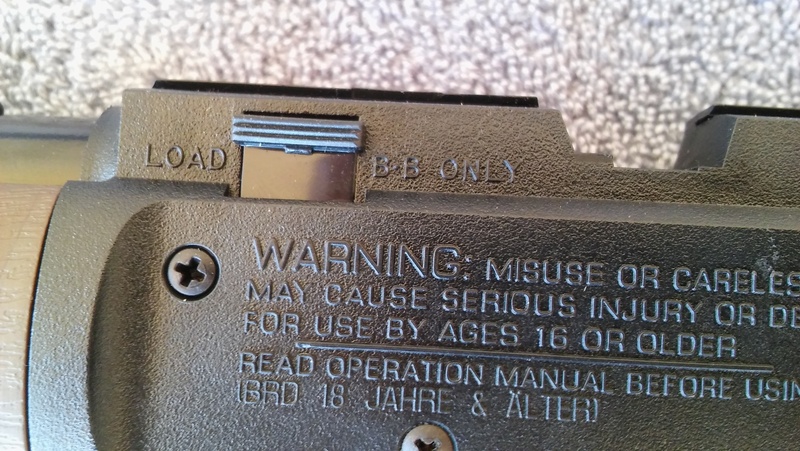 The open sights are adjustable for windage and elevation. 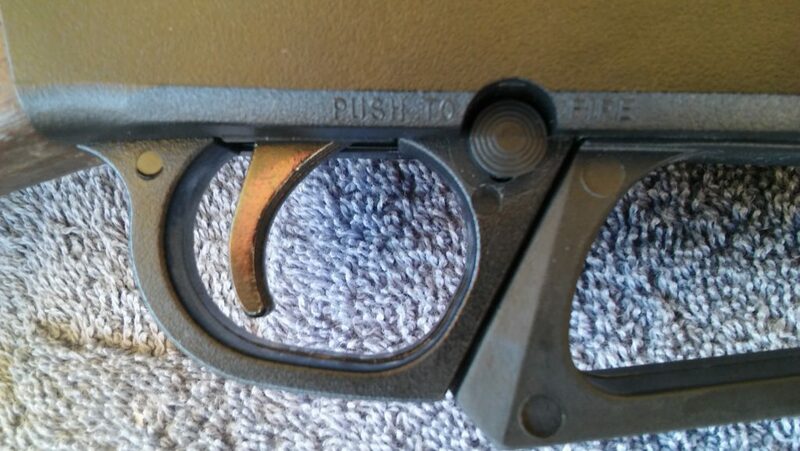 The rear sight is easy to line up with the front optic sight and proved to be quite accurate. The front blade sight is red fiber optic and lights up in the sunlight. This makes it very easy to line it up in the rear sight. These open sights are quick to align and accurate. The trigger guard features a button safety that engages when you push the button to “Safe”. It engages positively with a click and disengages as easily and securely. The trigger is all metal. The trigger pull is a little on the heavy side, most likely around 6 or 7 lbs. I am still able to get some really tight groups though. Here’s a better photo of the trigger. It’s pretty wide and grooved. I like it. 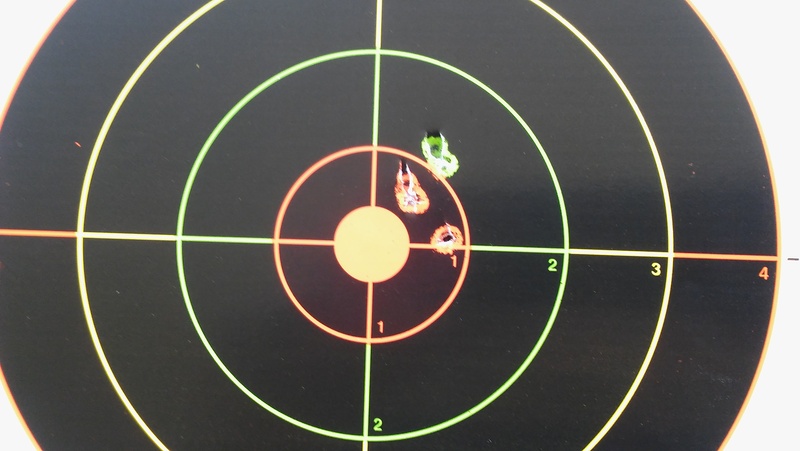 Here is one of the many 5 shot groups shot with the Daisy Powerline 880 pellet gun….and with open sights. The Daisy Powerline 880 will shoot both BBs and .177 pellets. It has a magazine that can hold 50 BBs. Once full, all you have to do is cycle the bolt and pump it up. Pellets are loaded one at a time. 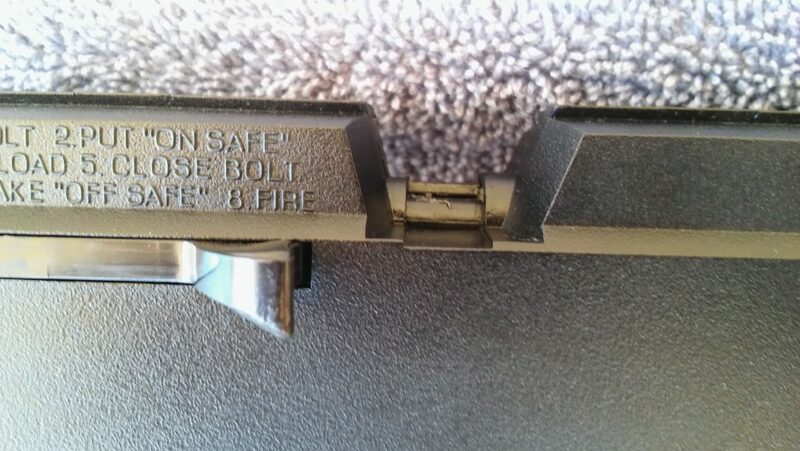 Here is a close up of the bolt. You pull it straight back then load 1 pellet and then push it forward to load the pellet into the chamber. It is a little tricky to get a pellet loaded properly. You have to get it aligned correctly otherwise it will jam. BBs load easily and quickly. Here’s the loading port. It’s a little tight for pellet loading, at least for my hands and eyes. I would like a little more room but for $35 you can’t get everything. 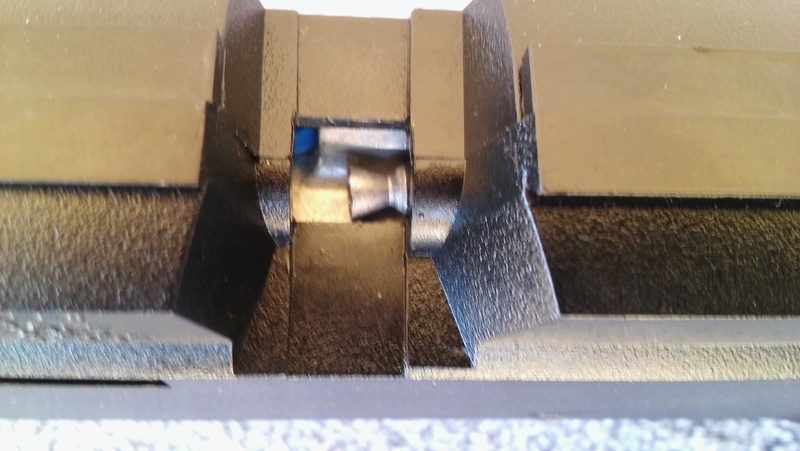 I have to drop the pellet in and then move it to align it correctly and then slowly push the bolt closed. Here you can see the bolt partially closed. It’s steel and magnetized to hold steel BBs. It pushes pellets into the chamber. 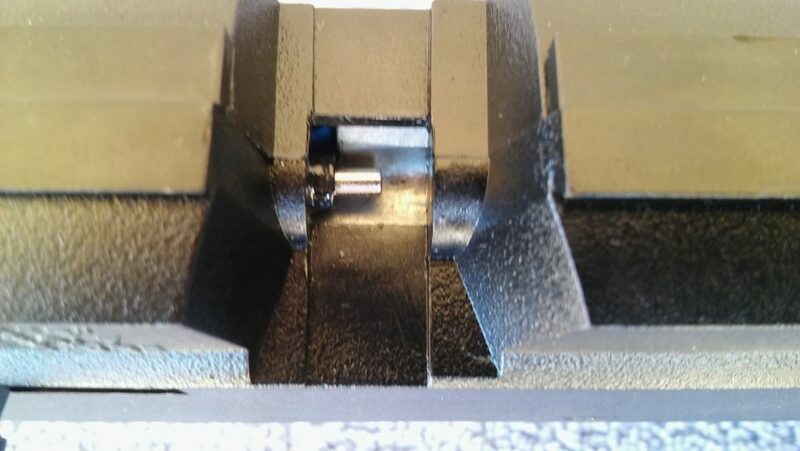 The rear of the pellet slides over the bolt head. 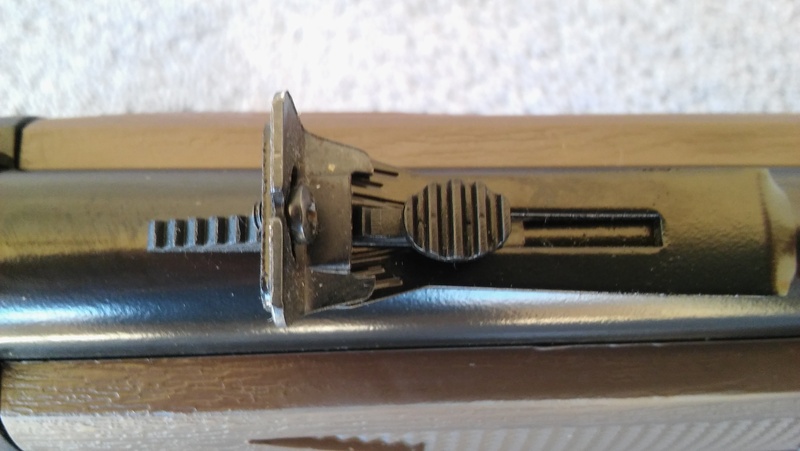 The pellet is loaded and aligned with the barrel chamber. The multi-pump handle is long with a really good grip handle. The long arm gives you more leverage to pump it. The 880 is very easy to pump 10 times. The pump handle snaps into place when the stroke is completed. The pump arm/handle is plastic and not very rigid. Care must be taken when pumping so the long arm does not break. It is however pretty flexible. The pump handle is large and will accommodate small or large hands. 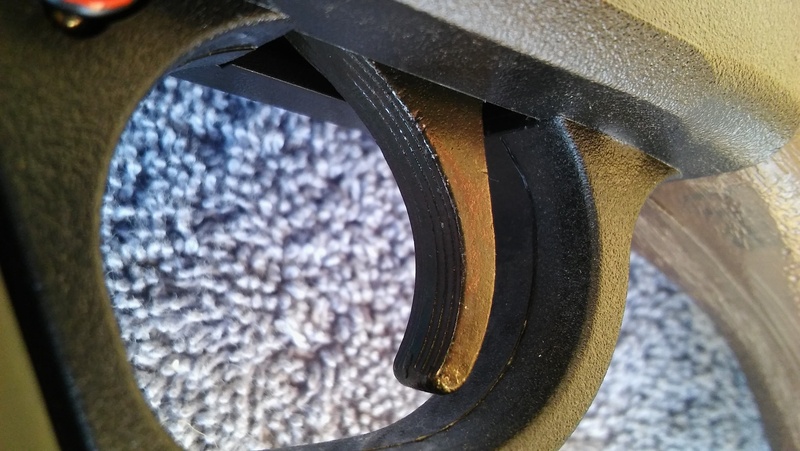 Although the pump arm/handle is all plastic the connecting arm and pump actuator are metal. These parts should last for a very long time. Here is the fully open pump position. It is a rather long stroke but makes for easy pumping. Here’s another 5 shot group from the Daisy Powerline 880 pellet gun. 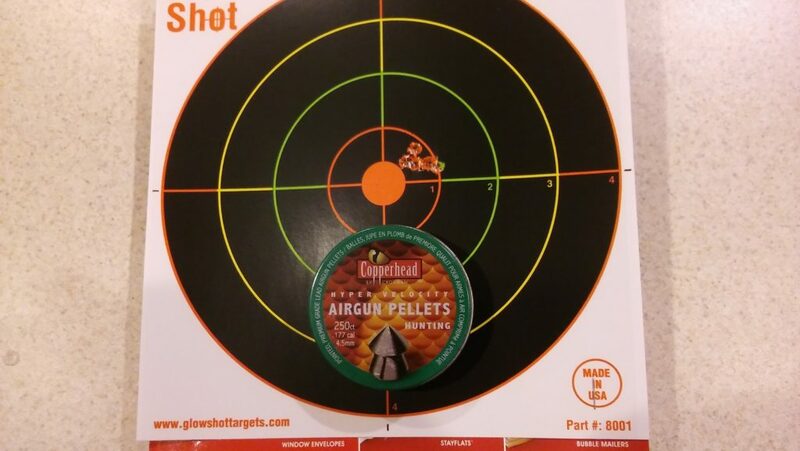 The Copperhead pellets are not known for accuracy like the JSB pellets but they still grouped very well. This is my bench rest setup for pellet gun testing. The utility trunk is ideal for bench resting airguns. The Powerline 880 proved to be accurate with most pellets with the exception of the very light hyper-sonic pellets. JSB pellets are most likely the moist accurate you can buy. 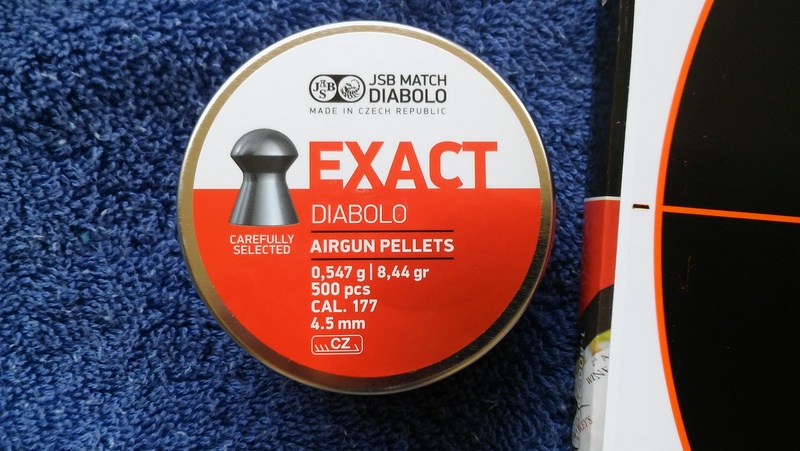 They fit tighter than most other pellets and are available is several weights including heavy weights for hunting. Although the Powerline did really well with standard Crosman pellets. Here’s the JSB pellet grouping of 5 shots. This is about a .60 inch group from 35 feet and with open sights. Oh yea and from a $35 pellet gun. I would give the Daisy Powerline 880 pellet gun 4 stars out of 5 stars. It’s powerful, accurate, easy to operate, durable and inexpensive. Wow! This entry was posted in Variable Pump by admin. Bookmark the permalink.